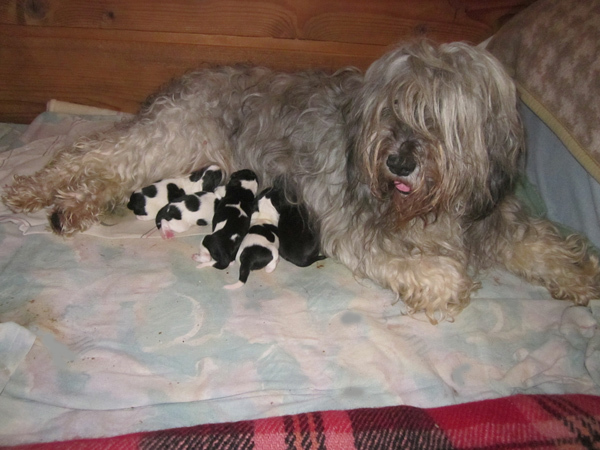 On the night of the first to the second of October she gave birth to her last puppies our beautiful Ch. Pl. DA IDYLLA BACÓWA z Banciarni FCI (O: Car z Liliowego Zacisza M, Lima Gaździna z Banciarni FCI). The father of puppies is Mł. Ch. Pl., Ch. Pl. DA BOSMAN Juhas Banciarnia FCI (Zacny Złajnik z Armii Zbawienia M: Ostrewka Bacówa z Banciarni FCI). Five puppies were born; 1 male and 4 females. All puppies have long tails, except a boy. All puppies are black and white except for one gray girl, unfortunately I’m fighting fourth day about her life . She was born without a sucking reflex and, despite feeding, it is not good. Please ,keep your fingers crossed for her.